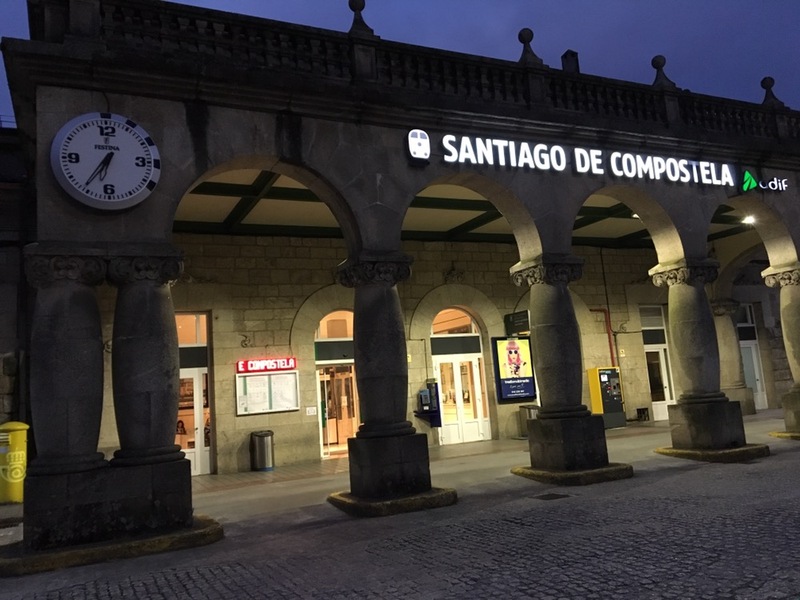 I was going to fly from Santiago to Madrid today but the airline changed the schedule from early afternoon to the evening. 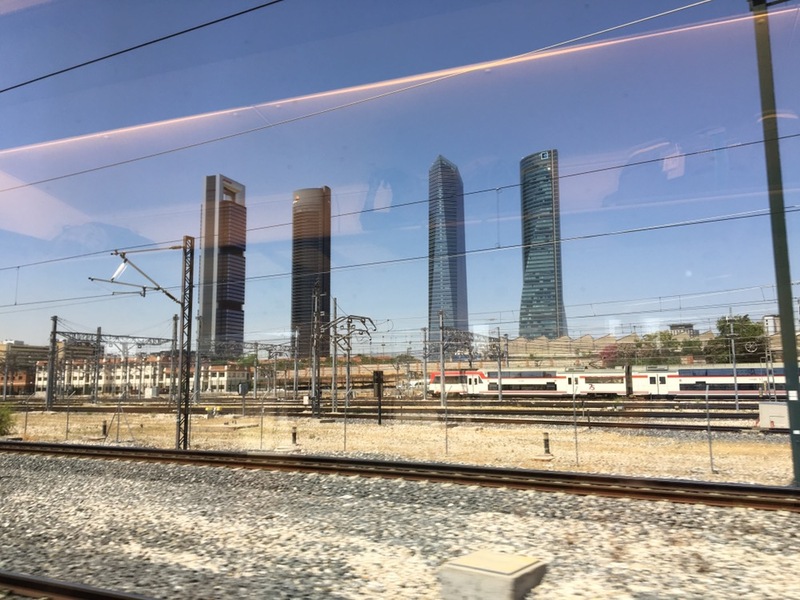 Since it would have been the last flight, I didn’t want to chance any problem–weather, mechanical–that might keep it from going and which would have put my flight from Madrid to Dallas in jeopardy, so I decided to catch the train instead. Glad I did. Took 5 hours and went through great countryside. It was an early morning departure. The sky was brooding, the air chilled, a good day to travel by train. I was like Henry when he was a kid traveling in the car: my eyes were fixated out the window, glued to the passing landscape. 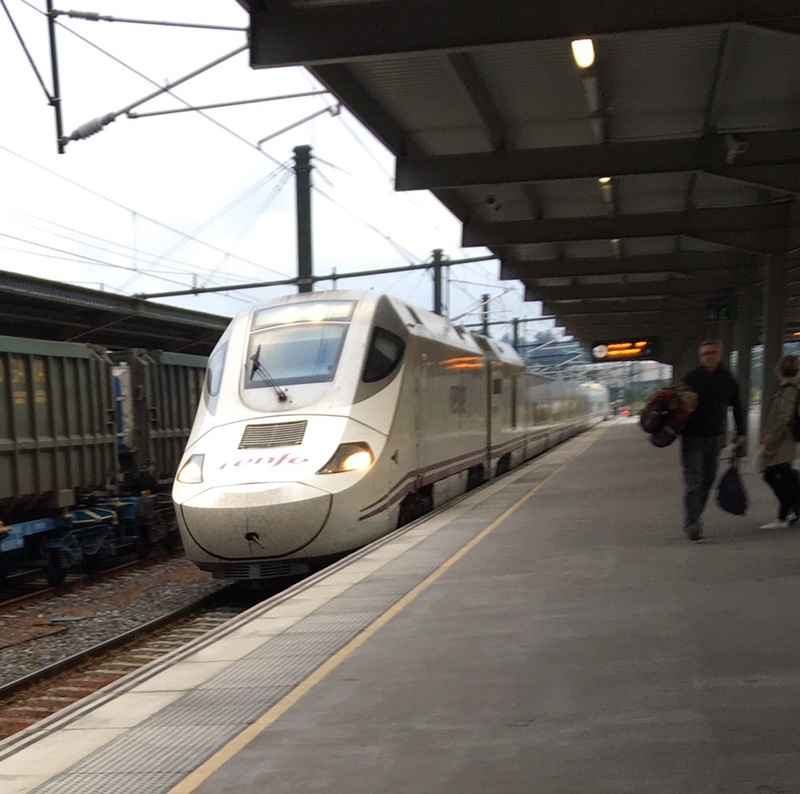 The soft rocking of the train on its rails lulled me into a hypnotic trance. 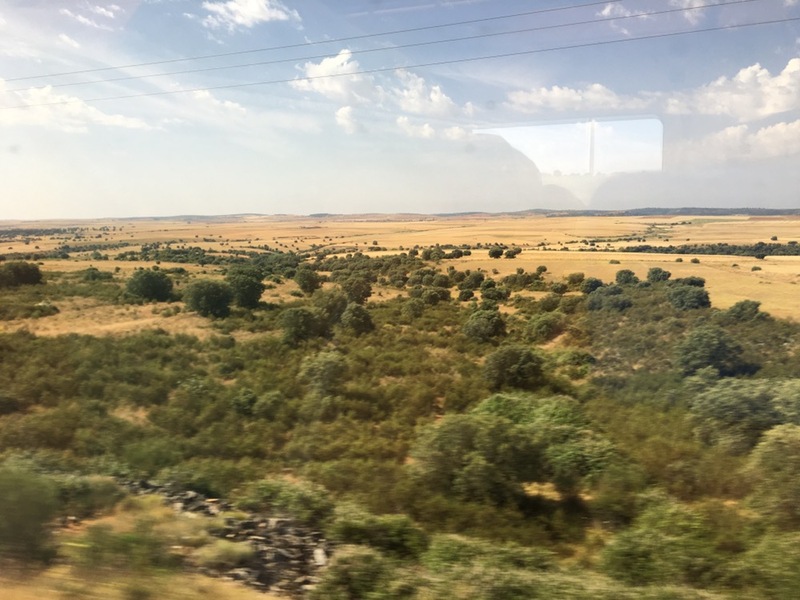 I could see myself walking the Camino on the paths the train crisscrossd through my reflection in the glass…and from the Camino I could see myself sitting in the comfort of the train looking out the window at me as it zoomed by. 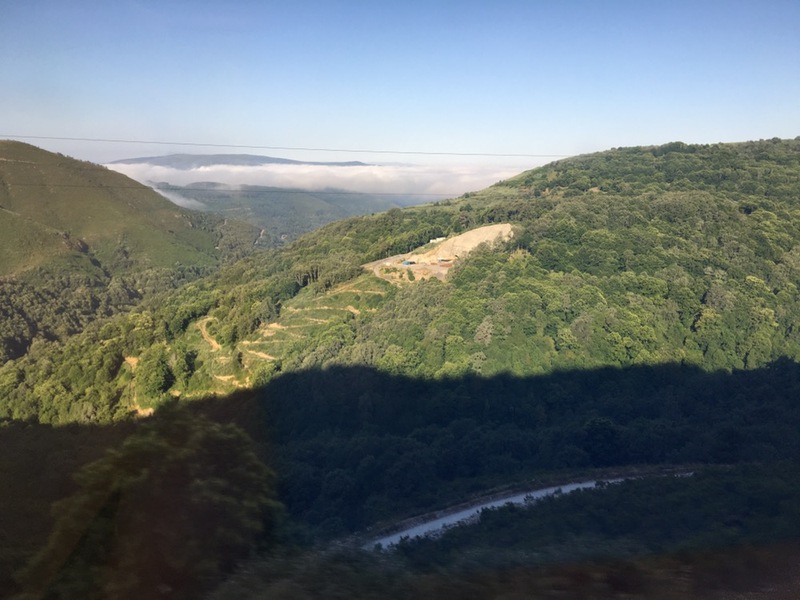 I was both and at the same time in two places: the luxury of a seated train and the laboring of putting one foot in front of the other with a full backpack, walking the Camino. Two places at the same time. Something I’ve longed to do all my life! 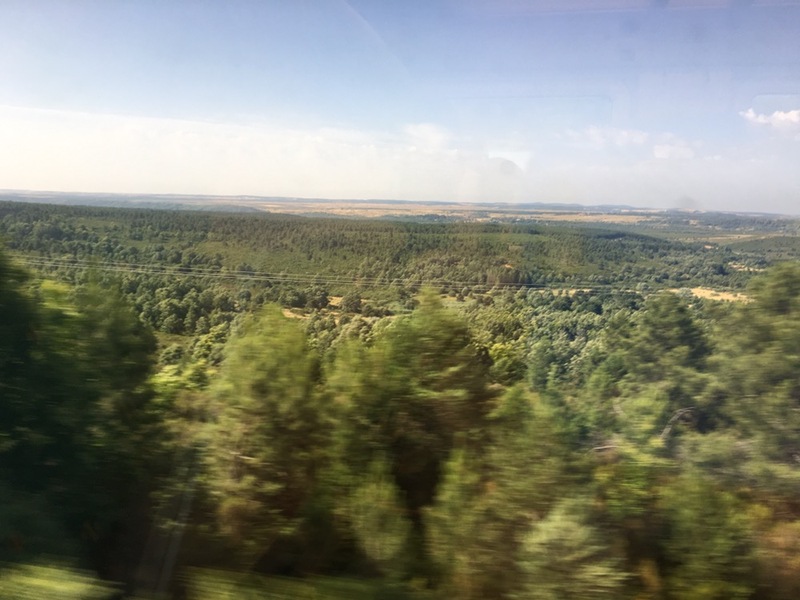 I’ve now had the luxury of seeing Spain from two perspectives: the close-up slow plodding on my feet and out the window of a zooming train. In many ways, the sweeping vistas reminded me of the landscape of northern New Mexico. Of course, Madrid changed all that! My hotel is near the airport. 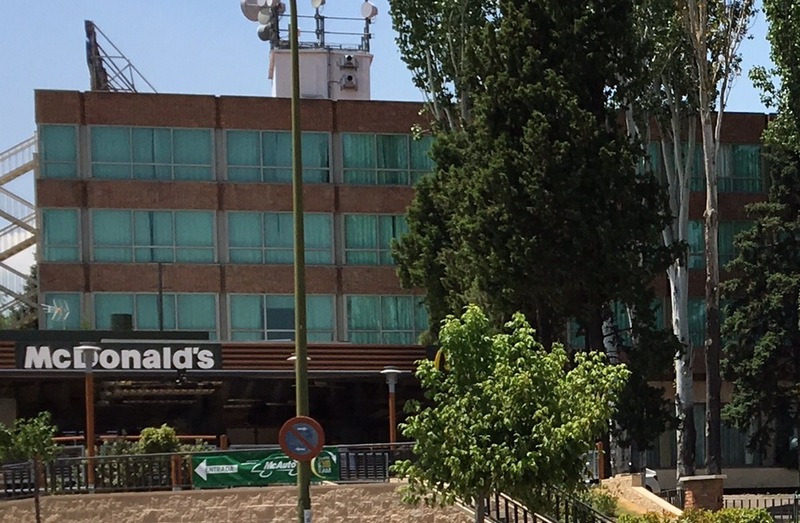 And right next to the hotel is a McDonald’s! 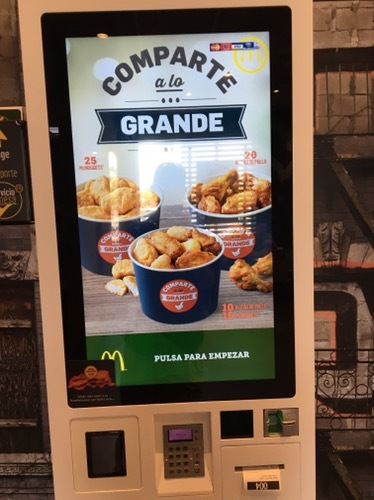 But not like any McDonald’s I’ve been in: outdoor seating with misters, and electronic ordering–you don’t go up to the counter to order. 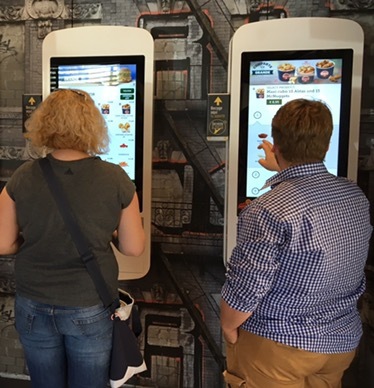 It’s all by a visual touch screen! After you place your order you get a number and they bring your order to you. McAmazing. While in Santiago I reconnected with Rod and Deborah–two of my great traveling companions–for a farewell lunch. It was nice reliving Camino memories. And they brought me a real shell from Finisterre! I also had dinner one evening with Richard and Monica from Australia who I met early on in Zubiri–or as Richard says, we were Stage 1 friends. Along with Suzanne from England, Nadia from Australia, Palo from Italy and Marie from Barcelona. Kinda international, huh? And I ran into several others throughout the day. But I missed many others–people who had leaped-frogged ahead or who stopped for extra rest days and who were behind me: the Korean priest; the three Japanese grandfathers (my pals from way back in Orisson); Claudia from Germany; Kirsty the vagabond street singer from Scotland; Don from Seattle; Chloie from France; and Elena, my adopted “granddaughter” from Chicago, who I met walking out of Pamplona. And so many others. But that is the way of the Camino. I think of them often. The Camino is truly a melting pot of nations. Tomorrow I catch a flight home. It’s time. I’ve been gone longer than I ever have–except in the Army. I don’t want to be away this long again. From my family: my kids and grandkids.